How to Have a Garden-Friendly Dog! Can you be a proud gardener and live with a dog? 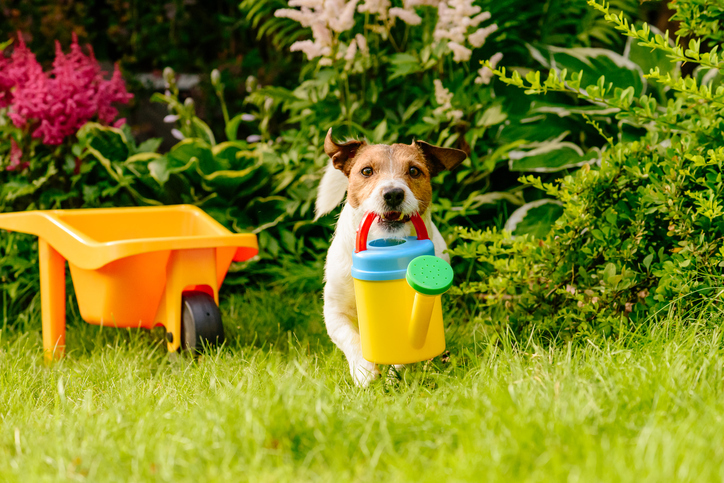 Many might think the two don’t mix but there are lots you can do to ensure owning a dog does not exclude you from beautiful flowerbeds or luscious lawns. Of course, it is inevitable that there will occasionally be accidents and sometimes a little damage, but you can minimise any adverse impact your dog might have: you certainly don’t need to resign yourself to a trashed plot which resembles a prison exercise yard. By combining common sense with a little ingenuity it is perfectly feasible to achieve a harmonious fusion of lovely garden and idyllic dog-space. 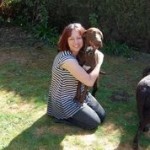 How you design and manage your garden is of course, ultimately up to you, but you will find life much easier if you garden with your dog, rather than in spite of him! Think of it as a gardening challenge to rise to, rather than a gardening problem. Got a dog who likes to dig? Give him a place of his own where he can excavate to his heart’s content. If he enjoys snoozing out there, then provide somewhere comfortable so he doesn’t have to make his own nest right in the middle of your flower bed. The only hard and fast rule when it comes to what you can include in your garden, is that the welfare of your dog always comes first. Gardens can, after all, be rebuilt and replanted, but your dog is irreplaceable - safety in the garden is paramount. Many common garden plants are poisonous to canines, so make sure you do your research thoroughly before investing in new flowers or scrubs. Many dogs think gardens are for toileting in or charging around. With a little training and some simple changes to management, we can teach a dog to pee and pooh in a dedicated area or do calm activities around the space instead of using it as a racetrack. Try exchanging ball games that trash your tulips for a sedate find it game where you hide treats, or every his dinner around a safe area for him to sniff out. Not only will it be kinder to your plants but will wear him out because he is using his primary sense, smell. Or maybe you can hide a favourite toy or try out some cool, cheap enrichment games like ball pits, snuffle mats or the cup game where you hide food under plastic cups which your dog will nose out and knock over for the tasty morsel underneath. To manage the damage we can teach commands like "leave it, off, give it," and "come." Even teaching your dog to have a quick response of looking at you when he hears his name can be helpful to interrupt a behaviour you want to stop. Try saying your dog’s name and when he looks at you, throw him a treat. He doesn’t have to do anything else, just look at you. Repeat this often and when he responds, instantly every time, you can add in another instruction like, "come here." This positive way of interrupting a behaviour will give you a better chance of saving the snapdragons than shouting at your dog as he digs it up. Encouraging your dog to take it easy in the garden doesn’t have to be a battle. You can best achieve this by first taking your dog for a nice walk and when home, if you are going in the garden, provide a comfy bed or mat to sleep on near his favourite spot. You can pre-train a settle command to encourage him to chill or sit with him for a cuddle, some soothing massage or do some gentle training to promote calmness and to tire out his brain as well as his body. If he can’t settle, maybe provide a containment area like a crate, pen or even tether him, using a lead attached to a harness and tether point. Make sure to provide him with water, a long-lasting tasty chew or stuffed enrichment toy and check on him often to ensure the sun hasn’t moved overhead or that he isn’t too chilly. By returning to him often and rewarding for staying on the bed will reinforce him wanting to be there. Whatever you do in the garden, a dog is a welcome companion so embrace some change to ensure you both love and care for the space and share it harmoniously. For more information have a look at Toni Shelbourne and Karen Bush’s book HELP! My Dog is Destroying the Garden, available in paperback and Kindle.